The yield curve for U.S. Treasuries (yield curve) refers to the relationship between the yield on short-term U.S. Treasury bills and progressively longer-term Treasury notes and bonds. In general, Treasury bills are issued with terms to maturity of one year or less. By contrast, Treasury notes and bonds are issued with longer terms to maturity of between 2- and 10-years and 10- and 30-years, respectively. The shape of the yield curve refers to the relative difference, or “spread,” between longer-term and shorter-term yields. 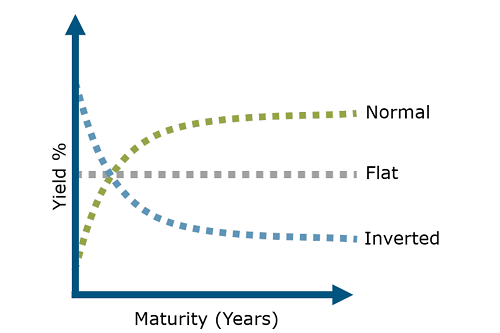 While the shape of the yield curve is constantly evolving in response to a myriad of factors, there are three commonly referenced yield curve formations: normal, flat, and inverted. 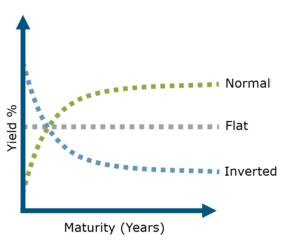 A normal yield curve is characterized by lower yields for shorter-term maturities and progressively higher yields for longer-term maturities. 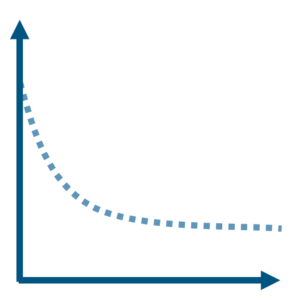 A normal yield curve is the most common and generally reflects a stable and expanding economy. The relative steepness of a normal yield curve can provide clues about the current and expected pace of economic activity. 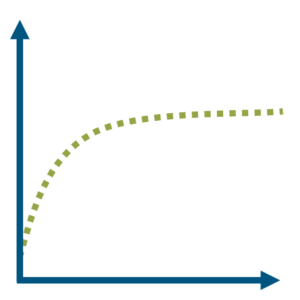 For example, a comparatively steeper normal yield curve can reflect accelerating rates of economic growth while a less steep normal yield curve can reflect a slowing pace of economic expansion. As implied by its name, a flat yield curve is characterized by similar yields across both short-term and long-term maturities. 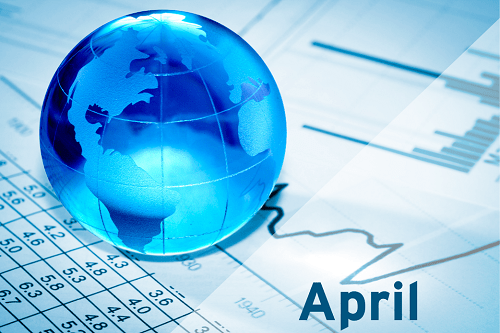 In general, a flat yield curve often reflects uncertain or deteriorating economic conditions. Against a backdrop of economic uncertainty, there is little differentiation between short-term and long-term yields, as they converge towards a common level. In a deteriorating economic environment, a flat yield curve may reflect concerns of further economic weakness. An inverted yield curve results when short-term yields are higher than longer-term yields. Inverted yield curves are rare and generally reflect periods of significant economic slowdown and often recession. Under such circumstance, investors may accept lower long-term yields because they believe economic conditions may deteriorate further and that short-term yields may be lowered to stimulate economic activity. Inverted yield curves have historically exhibited a strong correlation with economic recession. The persistent flattening trend of the current U.S. Treasury yield curve has been the subject of much discussion amongst economists and market participants. Recently the spread between 2- and 10-year Treasury yields has fallen to its lowest level in over a decade. Data unaudited. Many factors affect performance including changes in market conditions and interest rates and in response to other economic, political, or financial developments. 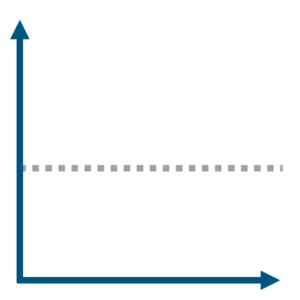 Investment involves risk including the possible loss of principal. No assurance can be given that the performance objectives of a given strategy will be achieved. All comments and discussions presented are purely based on opinion and assumptions, not fact. These assumptions may or may not be correct based on foreseen and unforeseen events. The information presented should not be used in making any investment decisions. This material is not a recommendation to buy, sell, implement, or change any securities or investment strategy, function, or process. Any financial and/or investment decision should be made only after considerable research, consideration, and involvement with an experienced professional engaged for the specific purpose. Past performance is no guarantee of future results. Any financial and/or investment decision may incur losses.